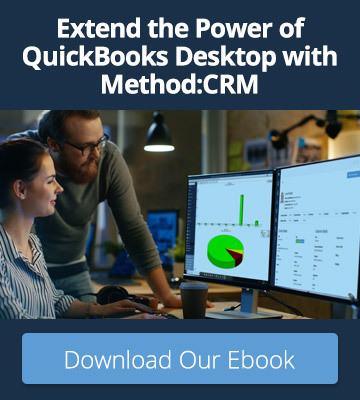 After five years running, QuickBooks Connect is known for bringing in spectacular speakers. Whether you’re attending a main stage presentation or an intimate breakout session, you’re sure to leave the talk feeling informed and inspired. The scale of the main stage talks makes them particularly special experiences. It’s not often that thousands of accountants, small business owners, and app developers gather in one massive room. Add in the fact that they’re there to listen to an accomplished professional tell an incredible story, and the energy of the room is off the charts. Here are four of our favorite moments from the main stage in San Jose. 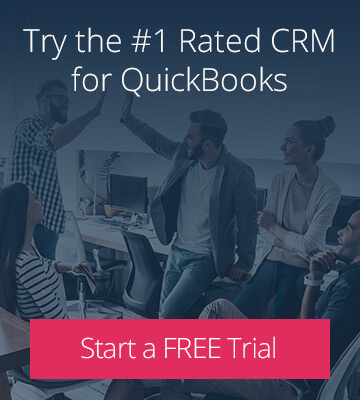 If anyone was struggling to wake up during the first morning of QuickBooks Connect, Vinh Giang undoubtedly gave them the boost they needed. 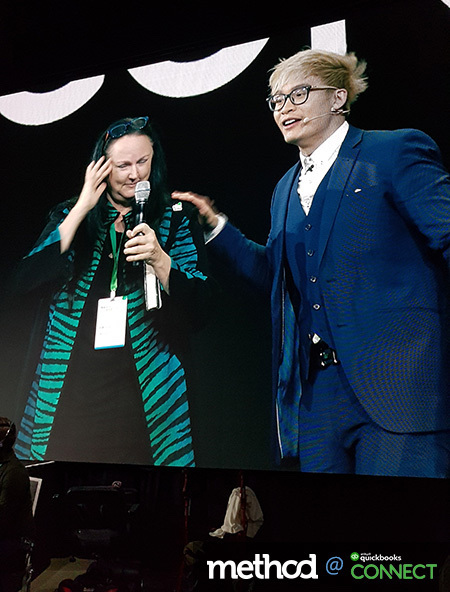 As an entrepreneur, magician and international keynote speaker, Giang has a captivating stage presence and a magnetic energy. He’s also really, really good at magic — and that was how he shared his message with conference attendees. Toward the end of his presentation, Giang called a volunteer up to the stage. He asked her to open a book to a random page and select a nice long word. He then asked her to close her eyes and repeat the word over and over in her head. All the while, Giang was confident he could identify the word in her mind. He scrawled the word “light-heartedly” on a piece of paper and showed it to the audience, who held their breath as they waited for the volunteer to speak her chosen word aloud. 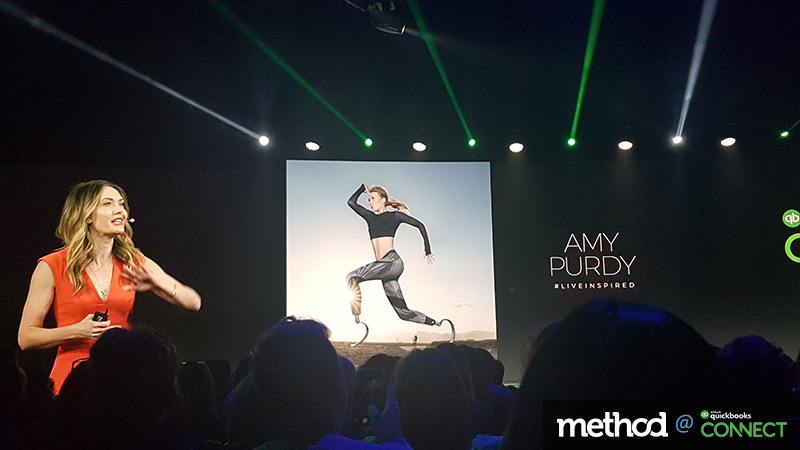 Amy Purdy is a Paralympic snowboarder, author, speaker, model, actress, and all-around inspirational human. After losing both legs at age 19 due to meningococcal meningitis, Purdy couldn’t imagine how she was ever going to pursue the dreams she had envisioned for herself. Eventually, though, she began to ask herself a question: “If your life was a book and you were the author of that book, how would you want your story to go?” She decided that she didn’t want her book to be the story of a woman with a handicap. She wanted it to be the story of a woman who achieves incredible goals. Purdy has been unstoppable since then. Among her many accomplishments are co-founding the nonprofit Adaptive Action Sports, winning a bronze medal at the 2014 Paralympic Games, and participating in the 2014 season of Dancing With the Stars. The quote above was in reference to Purdy’s struggle to find suitable prosthetic legs for her DWTS routines. Certain dances required her to balance on the balls of her feet or point her toes; actions that are no easy feat on most prosthetics. But every week, she worked hard to find a solution — and was ultimately named the runner-up on the show. 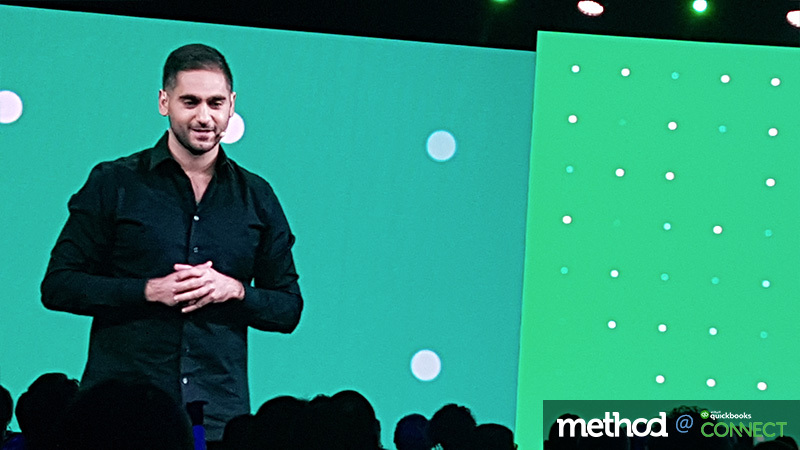 The final keynote at QuickBooks Connect was delivered by Alex Banayan. Banayan is the author of the national bestseller The Third Door, which details his personal quest to learn how the world’s most successful people launched their careers. The idea for the book arose when Banayan was a freshman in college, wondering what he was doing with his life. After failing to find a book that inspired him, he thought “Why not write it myself?” And so began the journey in which he appeared on The Price Is Right, won a sailboat, sold it, and used the money to fund his dream of interviewing mentors like Bill Gates, Steven Spielberg, Lady Gaga, and more. The book’s title refers to Banayan’s view on success: much like a nightclub, there are always three ways to get in. Most people will line up outside the main entrance. The VIPs will slip in through a private door. And a small handful of people will find the lesser-known third door, even if that “door” is really a cracked window that allows them to sneak in through the kitchen. During his talk, Banayan recalled being a terrified kid. That fear has been a huge obstacle in his life. So when he started interviewing people for the book, he assumed that they must have been fearless in pursuing their dreams. How else could they have achieved so much success? As it turned out, nothing could be further from the truth. “Not only were all the people I interviewed tremendously scared in the beginning; they were scared the whole way through.” But they didn’t let that stop them from taking action and seeking the third door anyway. We can’t end our discussion of main stage highlights without mentioning some of the inspiring words spoken by Brad Smith. 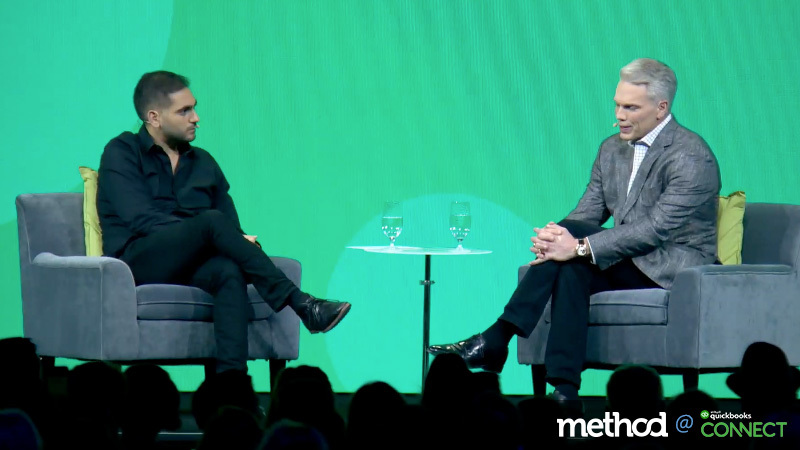 After 11 years as the CEO of Intuit, Smith announced in August that he will step down at the end of 2018 — meaning this was his final QuickBooks Connect in the leadership role. Smith took the opportunity to express his profound gratitude for the community that has been created by Intuit employees, accountants, business owners and developers alike. Building a strong pack has always been of the utmost importance to Smith. In an interview with Alex Banayan (who described Smith as a “professional nice person”), he recounted some of his favorite experiences from visiting Intuit locations around the world.